Overeating bad food is what gets you to gain weight, specifically body fat. When you are sitting there trying to figure out how to lose that weight, the logical solution would be to just stop eating all together, right? It seems to make perfect sense, but that couldn’t be farther from the truth. No matter how paradoxical it sounds, lets talk about why you have to eat to lose fat. Lets be completely honest with ourselves for a second. Most of us look in the mirror and see an area on our body that we want to improve by losing body fat. If you’re not in that category, chances are you know someone who is. One third of the United States is obese, so there is plenty of opportunity for fat loss. I would be willing to bet that most of the people that have tried to cut body fat have attempted to stop eating altogether, or at least some extreme fad diet. First we have to understand body fat. It is literally a form of energy storage for our bodies. If we eat a certain number of calories, and our body only needs part of that, the rest will go into storage called fat. 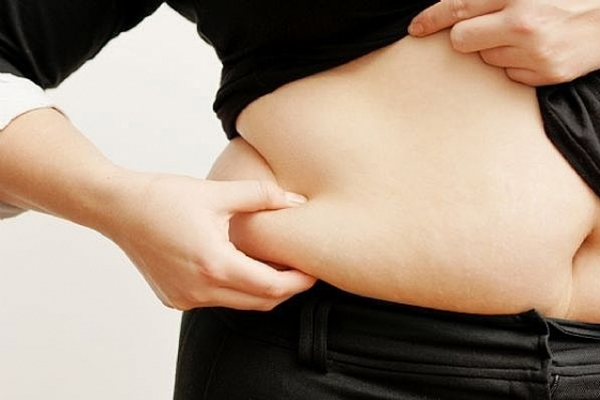 Your DNA dictates where that fat is stored. It can range from the stomach, hips, or even the back of the arms. Basically in order to get rid of that fat you have to give your body a reason to use it as energy for an active metabolism. The mistake that most people make is not eating anything in order to lose this fat. When you starve yourself a few things happen. First, your body will go into starvation mode. When this happens your metabolism starts to slowly shut down. You make your body think that it may not get food for a while so it will fight to keep every calorie and ounce of fat. It is basically like a protection mechanism which aids our survival. It would be beneficial if we were stranded out in the middle of nowhere and didn’t know when our next meal would come. Secondly, after a period of starvation, most of us will crack. When we crack under severe hunger we tend to gorge. It’s pretty much uncontrollable so you really don’t ever want to get to that point. You shouldn’t ever have to. Thirdly, gorging on a huge meal after your body is in starvation mode will cause the calories to be processed differently than normal. If your body is running on a slower metabolism and trying to cherish every calorie, the food that you throw at it all of a sudden will be stored as well. Guess what comes next? Yup, more body fat. When you starve yourself you tend to just end up eating more at the end of the day anyways. The only difference is that your body will have a slow metabolism when you do eventually eat. The solution to this nightmarish cycle is to eat! Here is where you have to be aware of what you are eating. The key is to eat small meals up to 8 or 10 times per day. Let me clarify what I mean by meal. When I say meal I am talking about more of a snack than anything. A meal can be an apple, a handful of nuts and berries, or even a piece of whole wheat toast with a thin layer of almond butter. When you first wake up you should make sure to eat something to start up your metabolism and prepare it to run throughout the day. Even if you are on the go, there is no excuse. An apple or banana is perfect to grab and run out of the house. There are a few reasons for eating numerous snack meals throughout the day. First of all, it makes you feel like you are constantly eating. Your body will feel less hungry because if you feed it every hour or two with a small snack your hunger mechanism won’t have time to torture you. Second of all, if you are constantly giving your body something small, you are basically assuring your body that it will be getting something to energize itself with. Everything that you put into your body will be pushed towards energy use as opposed to fat storage. By snacking every 2 hours or so, your metabolism will stay running high throughout the whole day. Your body will be much less inclined to store any of the calories as fat. If you want to see a flat stomach, or get rid of fat from other problem areas you simply have to eat. Don’t get me wrong you also have to exercise everyday. Turn it into a lifestyle, not just something you do whenever it’s time for a wedding or a beach vacation. If you want some tips to help you reduce your portion sizes check out the article, 7 Unbelievably Easy Ways To Decrease Portion Sizes. You may also be interested in 5 Fat Burning Substances In Food That You Should Add To Your Diet. If you have any questions about your own fitness journey don’t hesitate to contact me or leave a comment below. I will get back to you as soon as possible.